New poll results released on Sunday for the big March 15 primary elections show Donald Trump on top in Florida and home-state Senator Marco Rubio struggling for second place. Ohio’s Gov. 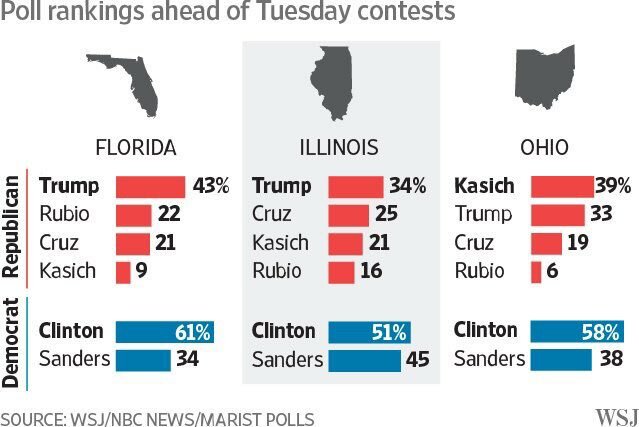 John Kasich is just ahead of Trump in his midwestern home state. In Florida, Rubio sits almost tied with Sen. Ted Cruz for second place in the new Wall Street Journal/NBC News/Marist poll. The establishment pick trails GOP frontrunner Trump by more than 20 per cent in Florida. 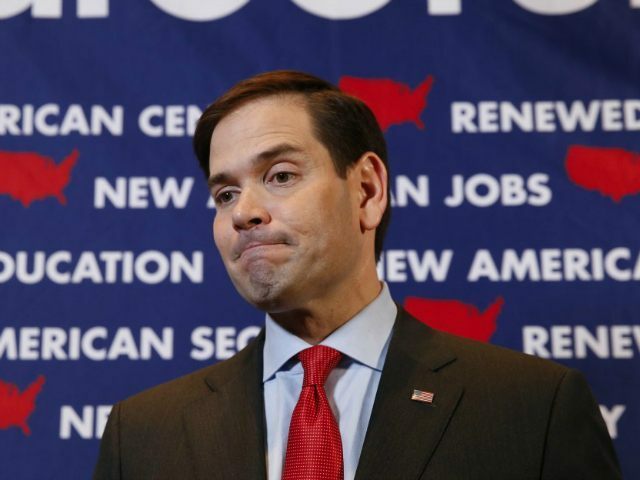 Rubio sits in last place in Illinois and Ohio, according to the survey conducted March 4-10. Kasich is winning his home state of Ohio with 39 per cent support to Trump’s 33 percent. Cruz comes in with 19 per cent there and Rubio with a mere 6. Rubio indicated on Friday that his Ohio supporters could vote for Kasich in an attempt to block Trump’s bid for the Republican nomination. The effectiveness of that play has yet to be seen, but it came at such a late hour it may have little to no effect. UPI reported that some 84,000 Ohioans have already marked their choice in early voting. In Florida, Trump polls at 43 percent, while Rubio at 22 percent is only 1 point ahead of Cruz at 21 percent. Kasich is last with just 9 per cent. In Illinois, Trump leads at 34 percent of likely Republican primary voters while Cruz is favored by 25 percent. Cruz will campaign aggressively in Illinois on Monday holding five campaign events in the course of the day. Kasich trails Cruz in the state at 21 percent and Rubio sits in last at 16 percent. On Sunday Rubio promoter Rep. Darrell Issa took to Fox News on Saturday to lobby for Rubio to remain in the race even if he doesn’t win Florida. Issa and his allies hope Rubio can enough delegates to deny Trump the nomination. On the Democratic side, Hillary Clinton leads Sanders in the three states polled, but in Illinois that margin is slim at 51 percent to Sanders’ 45 percent. Clinton’s margin is the greatest in Florida, where she is shown beating Sanders 61 percent to 34 percent. In Ohio, she leads 58 percent to 38 percent over Sanders. While Kasich and Rubio are battling in their respective home states Cruz won his home state of Texas in a definitive Super Tuesday victory. That contest delivered Cruz a significant chunk of his delegate count. After Saturday’s primary contests in Washington, D.C. and Wyoming, Trump has won 460 delegates, Cruz has 370, Rubio trails at 163 and Kasich sits in last with 63.